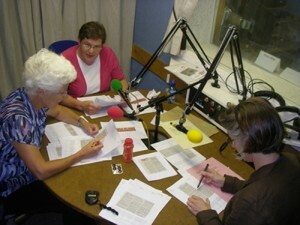 Oxtalk is run entirely by a dedicated group of volunteers. It is this diverse group who carry out the various functions required to take the news from the local newspapers and deliver it on digital usb flash drives to the visually impaired people of Oxford and its environs. If you think you can help us and would like to join one of our teams of editors, readers or copiers, please contact our Volunteers Co-ordinator Ray Anson on 01865 765609 or email mail@oxtalk.org.uk. The annual rota is not onerous, with duties being repeated between every four weeks to every eight weeks. For more details of how Oxtalk’s talking news is put together, please see How Oxtalk works. There may be other ways, too, in which you could help us – for example, we are always looking out for people to help with our publicity and fundraising campaigns. If you think you could help in any way do get in touch. The services of our volunteers are very much appreciated.